The bright light of restoration regularly weaves itself through the bloodshed and violence of the Old Testament. Ezekiel’s words of condemnation for idolatry and rebelliousness suddenly morph into a love story (Chapter 36) as God promises to sprinkle water on us to clean us from our impurities. God promises to give us a new heart and a new spirit. 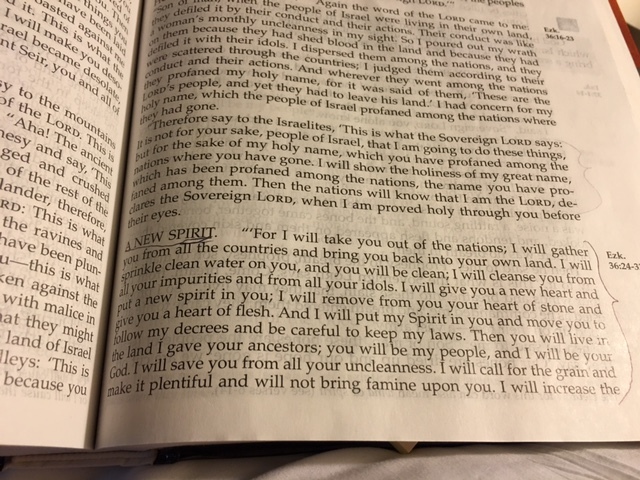 He promised the Israelites that he would put his spirit in them. Today, he does that immediately when we accept salvation through Jesus Christ. God’s Spirit lives in us, helping us to obey when we listen and respond to his directions. God promises to rebuild the things that are ruined in our lives. He promises that the desolation of our souls will be replaced by a fruitful, beautiful garden like the Garden of Eden. The destroyed pieces of our lives will come back alive. 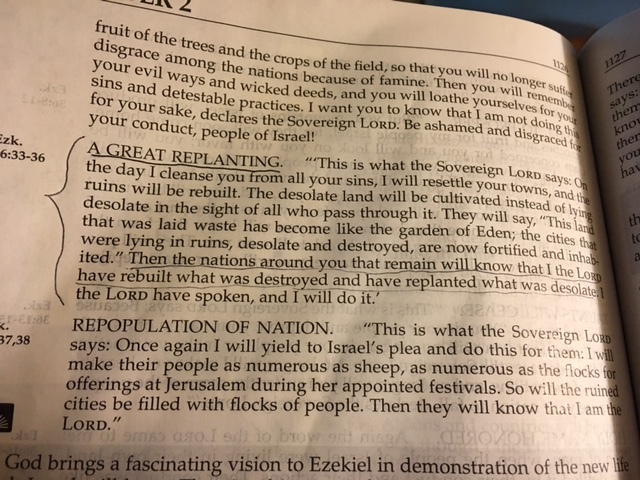 Then those around us will know “that I, the LORD, have rebuilt what was destroyed and have replanted what was desolate. I, the LORD, have spoken and I will do it.” (vs 36). Thank you for your restoring love and grace, Abba Father.